The most convenient way to get 66 daily Essential Vitamins, Minerals, and Plant + Nutrients and Essential Oils. 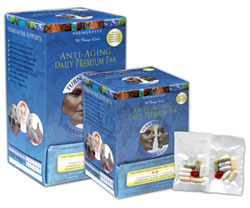 Youngevity's scientist, Dr. Richard Cutler, a former lead biochemist on Anti-Aging with the National Institute on Aging for 19 years is quoted: "This is the strongest daily anti-aging Program on the market today. The benefits I receive from the Anti-Aging Daily Premium Pak are a higher energy level, greater vitality and libido, enhanced immunity while reversing aging everyday!"